Beyond the records of his baptism in 1564 and his burial in 1616 there is little documentary evidence for William Shakespeare’s life, although there are many unverifiable stories and anecdotes. Even the traditional date for his birth, St George’s Day, 23 April, is uncertain. What evidence there is connects him firmly to Stratford-upon-Avon, where he was born, married, and died. Nothing is known of Shakespeare’s early life before his marriage, at the age of 18, in 1582. For five years, when he was in his 20s, there is nothing to tell us where Shakespeare was or what he was doing. He disappears from Stratford records after 1587, and reappears only in 1592 in London. We do not know how and when he became an actor, or when he began writing plays either in collaboration with other dramatists or alone. His work as a dramatist is recorded through his published plays, but his career as an actor is virtually undocumented. Shakespeare is mentioned occasionally, in official records, in the records of the lives of his relations and friends, and in the writings of his fellow actors and dramatists, and that is all. His life and career have been more extensively researched than those of any other writer, but the evidence remains elusive. T he play begins with the brief appearance of a trio of witches and then moves to a military camp, where the Scottish King Duncan hears the news that his generals, Macbeth and Banquo, have defeated two separate invading armies—one from Ireland, led by the rebel Macdonald, and one from Norway. Following their pitched battle with these enemy forces, Macbeth and Banquo encounter the witches as they cross a moor. The witches prophesy that Macbeth will be made thane (a rank of Scottish nobility) of Cawdor and eventually King of Scotland. They also prophesy that Macbeth’s companion, Banquo, will beget a line of Scottish kings, although Banquo will never be king himself. 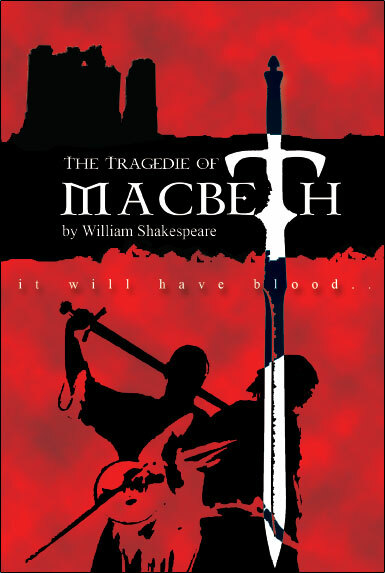 The witches vanish, and Macbeth and Banquo treat their prophecies skeptically until some of King Duncan’s men come to thank the two generals for their victories in battle and to tell Macbeth that he has indeed been named thane of Cawdor. The previous thane betrayed Scotland by fighting for the Norwegians and Duncan has condemned him to death. Macbeth is intrigued by the possibility that the remainder of the witches’ prophecy—that he will be crowned king—might be true, but he is uncertain what to expect. He visits with King Duncan, and they plan to dine together at Inverness, Macbeth’s castle, that night. Macbeth writes ahead to his wife, Lady Macbeth, telling her all that has happened. Macbeth is a Scottish general and the thane of Glamis who is led to wicked thoughts by the prophecies of the three witches, especially after their prophecy that he will be made thane of Cawdor comes true. Macbeth is a brave soldier and a powerful man, but he is not a virtuous one. He is easily tempted into murder to fulfill his ambitions to the throne, and once he commits his first crime and is crowned King of Scotland, he embarks on further atrocities with increasing ease. Ultimately, Macbeth proves himself better suited to the battlefield than to political intrigue, because he lacks the skills necessary to rule without being a tyrant. His response to every problem is violence and murder. Unlike Shakespeare’s great villains, such as Iago in Othello and Richard III in Richard III, Macbeth is never comfortable in his role as a criminal. He is unable to bear the psychological consequences of his atrocities. Macbeth’s wife, a deeply ambitious woman who lusts for power and position. Early in the play she seems to be the stronger and more ruthless of the two, as she urges her husband to kill Duncan and seize the crown. After the bloodshed begins, however, Lady Macbeth falls victim to guilt and madness to an even greater degree than her husband. Her conscience affects her to such an extent that she eventually commits suicide. Interestingly, she and Macbeth are presented as being deeply in love, and many of Lady Macbeth’s speeches imply that her influence over her husband is primarily sexual. Their joint alienation from the world, occasioned by their partnership in crime, seems to strengthen the attachment that they feel to each another. Three “black and midnight hags” who plot mischief against Macbeth using charms, spells, and prophecies. Their predictions prompt him to murder Duncan, to order the deaths of Banquo and his son, and to blindly believe in his own immortality. The play leaves the witches’ true identity unclear—aside from the fact that they are servants of Hecate, we know little about their place in the cosmos. In some ways they resemble the mythological Fates, who impersonally weave the threads of human destiny. They clearly take a perverse delight in using their knowledge of the future to toy with and destroy human beings. The brave, noble general whose children, according to the witches’ prophecy, will inherit the Scottish throne. Like Macbeth, Banquo thinks ambitious thoughts, but he does not translate those thoughts into action. In a sense, Banquo’s character stands as a rebuke to Macbeth, since he represents the path Macbeth chose not to take: a path in which ambition need not lead to betrayal and murder. Appropriately, then, it is Banquo’s ghost—and not Duncan’s—that haunts Macbeth. In addition to embodying Macbeth’s guilt for killing Banquo, the ghost also reminds Macbeth that he did not emulate Banquo’s reaction to the witches’ prophecy. The good King of Scotland whom Macbeth, in his ambition for the crown, murders. Duncan is the model of a virtuous, benevolent, and farsighted ruler. His death symbolizes the destruction of an order in Scotland that can be restored only when Duncan’s line, in the person of Malcolm, once more occupies the throne. A Scottish nobleman hostile to Macbeth’s kingship from the start. He eventually becomes a leader of the crusade to unseat Macbeth. The crusade’s mission is to place the rightful king, Malcolm, on the throne, but Macduff also desires vengeance for Macbeth’s murder of Macduff’s wife and young son. The son of Duncan, whose restoration to the throne signals Scotland’s return to order following Macbeth’s reign of terror. Malcolm becomes a serious challenge to Macbeth with Macduff’s aid (and the support of England). Prior to this, he appears weak and uncertain of his own power, as when he and Donalbain flee Scotland after their father’s murder. خلال حكم الملك العظيم دنكان ، ملك اسكتلندا ، كان يعيش لورد عظيم اسمه ماكبث. وكان من رجال الملك المقربين ، لما يتمتع به من شرف وشجاعة فى القتال . وعندما كان القائد ماكبث وزميله القائد بانكو ، عائدين منتصرين من موقعة كبيرة ، استوقفتهما ثلاثة اشباح ، اقرب الى شكل النساء ، فيما عدا ان لهم ذقونا ، كما أن جلودهم الشاحبة وملابسهم الغريبة حعلتهم لا يبدون مثل المخلوقات الأرضية .. وبادرهم ماكبث بالحديث ، لكن كل واحدة منهن وضعت اصابعها على فمها طالبة السكوت ؛ ونادته الأولى بأسمه (ماكبث) وبلقبه الرسمى لورد جلاميس . واندهش القائد كثيرا عندما وجد نفسه معروفا من قبل تلك المخلوقات ؛ لكن دهشته ازدادت عندما نادته الثانية بلقب لورد كاودور ، هذا اللقب الذى لم يكن يستحقه .. أما الثالثة فقد نادته قائلة : "مرحبا ؛ بالملك القادم ! " ولقد ادهشته هذه النبوءة لأنه كان يعرف ، أنه طالما أن أبناء الملك أحياء ، فلا يستطيع أن يأمل فى الوصول الى العرش ، ثم التفتن الى القائد بانكو وتعرفن عليه ، وقلن له بكلمات غامضة : " ستكون أقل شأنا من ماكبث ، ولن تكون سعيدا فقط ، بل موفور السعادة ! وتنبأن له ، بأنه لن يتولى العرش أبدا ، الا أن أبناءه من بعده سيكونون ملوكا لاسكتلندا .. ثم استدرن فى الهواء واختفين ، وهنا تأكد القائدان أنهن ساحرات ..
وبينما هما واقفين يفكران فى هذه الأمور الغريبة وصل رسول خاص من قبل الملك . ليخلع على ماكبث لقب واسم دوقية كاودور . وكان لهذا الحدث الغريب أثره على نفس ماكبث ، لأنه تطابق مع ما قالته الساحرات ، الأمر الذى ملأه بالحيرة فوقف مذهولا ، غير قادر حتى على الرد على الرسول .. ومنذ تلك اللحظة ، بدأت الآمال الضخمة تداعب ذهنه ، فى امكانية تحقيق النبوءة الثالثة ، وبالتالى فقد يصبح ذات يوم ملكا لاسكتلندا .
" ان هذه الأمل قد يدفعك للتطلع الى العرش ، لكن رسل الظلام قد يصدقون معنا فى أشياء صغيرة ، حتى تقودنا الى ارتكاب أفعال شريرة " . لكن كلمات الساحرات ، كانت قد استقرت فى أعماق تفكير ماكبث ، حتى أنه أعرض عن تحذيرات بانكو الطيب . ومنذ ذلك الوقت وجه كل تفكيره فى كيفية الفوز بعرش اسكتلندا ..
(2) الخـــــط الدرامــــى عندما قص ماكبث لزوجته تلك النبوءة الغريبة للساحرات ، وما تلى ذلك من أحداث . وكانت الليدى ماكبث سيدة شريرة تطمح فى مكانة عالية لنفسها ولزوجها ، وتتمنى لو أنها هى وزوجها يصلان الى هذه المرتبة العظيمة بأية وسيلة كانت . وأخذت تناقش ماكبث فى ذلك الأمر ، ولم تتورع فى أن تقول له ان قتل الملك أمر ضرورى جدا لتحقيق النبوءة . وحدث فى تلك الفترة أن قام الملك بزيارة ماكبث فى قلعته ، بصحبة ولديه مالكولم ، ودونالبين ، ومجموعة من اللوردات والمستشارين لتهنئة ماكبث بانتصاره فى الحرب . كانت قلعة ماكبث مبنية فى مكان لطيف ، والهواء هناك منعش وصحى ، حيث أقامت طيور السنونو أعشاشها على الجدران ، ذلك أن هذه الطيور ، لا تقيم أعشاشها الا فى الأماكن المعروفة بجوها الطيب وعندما دخل الملك ، سعد جدا بالمكان ، وسعد كذلك بنفس القدر لذلك الاهتمام والاحترام والتبجيل الذى لاقته به السيدة المضيفة ليدى ماكبث ، التى كانت تجيد فن تغطية أهدافها الشريرة ، وراء ابتسامتها ؛ وتبدو كالزهرة البرية ، التى تخفى حية تحتها ! الملك . وهى لم تكن تفعل ذلك خروجا عن المألوف بطبيعة كونها امرأة ، لكنها كانت متخوفة من طبيعة زوجها ؛ من أن تكون مشبعة بلين العاطفة الانسانية ، للقيام بعملية القتل . ورغم أنها كانت تعرف رغباته الطموحة ؛ لكنه كان يخشى ارتكاب الأخطاء الفاحشة ، ذلك أنه لم يعد لارتكاب مثل هذا الجرم العظيم . صحيح أنها نجحت فى اقناعه بالجريمة ، لكنها كانت تشك فى ارادته بالتنفيذ ، ولتلك الرقة التى كان يتميز بها قلبه ( اذ كان أكثر منها كرما ولطفا ) والتى قد تعوق تنفيذ المهمة . لذلك قامت هى نفسها بالذهاب الى حجرة نوم الملك وبيدها سكين حادة ، واقتربت من سرير الملك ، وقد عملت حسابها أن يكون الخادمان فى حالة سكر وغافلين عن الحراسة . كان دنكان يرقد نائما يشخر من أثر تعب الرحلة ؛ وعندما نظرت اليه عن قرب ، وجدت فى وجهه وهو نائم شيئا ما ، جعلها تفكر فى والدها . ولم يطاوعها قلبها أن تهم بقتله ! وعادت لتتحدث مع زوجها ، الذى بدا متراجعا حيال ذلك الأمر . فهناك عدة اعتبارات تقف الآن ضد هذه الفعلة . ففى المقام الأول هو ليس شخصا عاديا ، بل من المقربين الى الملك ؛ كما أن الملك يحل فى ضيافته اليوم ، ومن واجب المضيف أن يمنع أية محاولة لقتل ضيفه لا أن يحمل هو سكين الجريمة ، بل ورأى أن الملك دنكان ملك رحيم ، واضح فى خصومته مع أعدائه ، ومحب لأعوانه من النبلاء ، وبالنسبة له بصفة خاصة .. ان مثل هؤلاء الملوك هم رسل العناية الالهية ، وسوف يلقى كل من يؤذيهم العقاب مضاعفا من أعوانهم . هذا بالاضافة الى أن الملك كان يخصه دون الرجال جميعا لرجاحة فكره ، فكيف يلوث كل هذا التكريم ، بدماء جريمة بشعة كهذه ؟ ! . واكتشفت الليدى ماكبث أن زوجها بدأ يتحول تجاه الخير ، وقرر ألا يتمادى فى ذلك الأمر أكثر من ذلك .. لكنها كانت أمرأة من ذلك النوع الذى لا يتراجع عن هذفه الشرير بسهولة .. فبدأت تصب فى أذنيه كلمات تشحن رأسه بوجهة نظرها .. وأخذت تقدم له المبرر تلو المبرر لكى لا يتراجع عن تحقيق ما وعدته به الساحرات ؛ وكم سيكون التنفيذ سهلا ؛ وكيف أن فعله مثل هذه ذات ليلة قصيرة ، ستسعد باقى لياليهم وأيامهم القادمة ، وتوصلهم الى العرش والسلطة الملكية ! .وأخذت تسخر من تراجعه عن قصده ووصفته بأنه متردد وجبان . وهكذا ، تناول الخنجر فى يده ، وتسلل بخفة الى الحجرة التى يرقد فيها دنكان ! ولكن بينما كان فى طريقه ، تخيل أنه رأى خنجرا آخر فى الهواء مقبضه يتجه ناحيته ، ونصله يقطر دما . وعندما حاول أن يمسكه ، لم يكن هناك شئ غير الهواء ، وأن الأمر ليس الا مجرد خيالات ، نتيجة لما يدور فى رأسه المحموم والمهمة التى ينبغى عليه أن ينفذها ..
ونفض عنه خوفه ، ودخل غرفة الملك ، وقتله بضربة واحدة من خنجره .. وبمجرد اقتراف الجريمة ، ابتسم أحد الخدم المرافقين للملك ، وهو نائم ، بينما صاح الآخر : " جريمة " واستيقظ الاثنان . وشرعا فى تلاوة صلاة قصيرة ، وقال أحدهما ، " فليغفر لنا الله ! " فأجاب الآخر ؛ " آمين ! " ثم عاودا النوم مرة ثانية . وحاول ماكبث الذى كان يقف مصغيا اليهما ، أن يقول : " آمين " . عندما قال أحدهما ، " فليغفر لنا الله ! " ، الا أن الكلمة وقفت فى حلقه ، ولم يستطع أن يقولها ، رغم أنه كان فى حاجة ملحة للمغفرة .. ! وتخيل أنه سمع صوتا يصيح " : لن يذوق ماكبث طعم النوم بعد الآن : لأنه قتل نائما ، نائما بريئا ، وهذه سنة الحياة " . وظل الصوت يردد صيحاته فى أرجاء البيت : " لن يذوق طعم النوم بعد الآن ، فلقد قتل لورد جلاميس رجلا نائما ، لذا فلن يذوق لورد كاودور طعم النوم ؛ لن ينام ماكبث بعد الآن ! ..
ومع طلوع الصبح ، اكتشفت الجريمة التى لا يمكن اخفاؤها . وأظهر ماكبث وزوجته حزنا كبيرا ، وكانت الأدلة ضد الخدم من القوة بما فيه الكفاية لادانتهما . رغم أن كل الاتهامات الخفية كانت تشير الى أن ماكبث هو الذى فعلها ، لأن لديه من الدوافع القوية أكثر مما لدى الخدم المسكين للقيام بذلك ؛ وهرب ابنا دنكان مالكولم ، الأكبر ، الى انجلترا ، ودونالبين الأصغر ، الى ايرلندا ..
وبهروب ابنى الملك ، اللذين كانا من المفروض أن يخلفاه فى الملك ، أصبح العرش خاليا ، وتوج ماكبث ملكا ، وهكذا تحققت نبوءة الساحرات تماما . الحوار متقن وايقاعه يبطئ فى فصل ويسرع فى فصل أخر فهو يتلاحم مع نسيج العمل ، ولم يترك الكاتب مساحات فراغ ، بل نلاحظ براعة النسج وتواصل الأحداث . دنكان ، ملك اسكتلندا . - ماكبث ، لورد جلاميس ، وقائد جيش - دنكان . - مالكولم أبن دنكان . - دونالبين ابن دنكان . - فليانس ، ابن بانكو . - ماكدوف ، لورد فايف . نجد أن احداث المسرحية تسير فى خط درامى الى نهاية مأساوية . وهى تسير فى تسلسل منطقى بداية من مقابلة القائد ماكبث للساحرات الثلاث ، وتصديقه لنبوءاتهم السحرية الكاذبة ، ونتيجة لذلك اقترف الاثام والخطايا فلاقى نهاية مأساويه هو وزوجته الشريرة التى غيرت مسار حياته من الخير الى الشر . اذن فالمسرحية ذات هدف واضح وهو عدم تصديق نبؤة الساحرات والعالم السفلى ومن الاجدى الاتجاه الى العلم الدينى المفيد الذى تنادى به السماء وكم حذرتنا الأديان السماوية جميعا من تصديق السحرة فهم أخوان للشياطين اللذين يضللون الإنسان ويدفعون به الى الجنون فى النهاية والعلوم الدنيوية تنادى بالمنطق العقلى والتفكير العميق السليم اذا وقع الإنسان فى خطأ تجاه المجتمع والبشرية فعليه أن يحاسب نفسه قبل أن يفعل شيئا يضر بمن حوله ولا ينقاد الى الاوهام والخزعبلات بالاعتقاد فى السحر أنه سيحقق المجد والشهرة كما هو الحال عند ماكبث . انما كل شئ مقدر عند الله حاكم هذا الكون الفسيح الذى يوزع الارزاق وبيده القضاء والقدر . والمسرحية مؤثرة علميا وتربويا ونفسيا فهى تعلمنا الرضا بما قسم لنا الله وعدم الطمع والسيطرة على مال الغير بطرق وحشية غير انسانية (ومن حفر لأخيه حفرة وقع فيها) وتعلمنا أيضا أن نرد المعروف بأحسن منه لا أن نعتدى على الاخرين فى سبيل تحقيق المصلحة الشخصية . وهذا من سمات المسرح عند كاتب مشهور مثل وليم شكسبير . . . . ! !